To sum up – it’s a machine that performs pretty well, it’s powerful and flexible, but all this at the expense of battery life. owadays it’s extremely difficult to surprise the public with innovative decisions and ideas no one has yet thought of, especially in the infinite technology world where the competition is just so great… But I am sure this video review will prove me wrong because the product we tested for you this time has the potential and proper make while at the same time it incorporates interesting and innovative decisions. 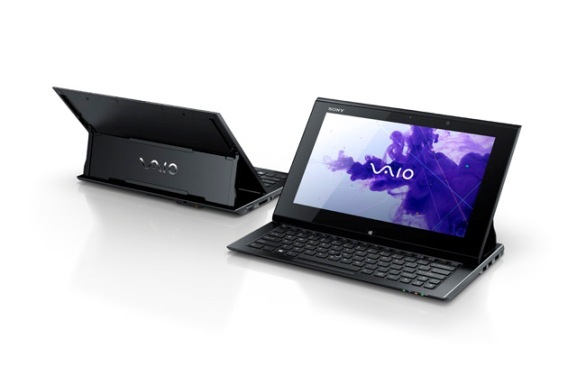 Today, the official premiere of Sony VAIO Duo 11 takes place. Digital Magnet had the opportunity to test the product for a few days so that we could share with you our impressions from the product just in time. The Sony VAIO Duo 11 belongs somewhere in the middle between the tablet category and the one of ultrabooks. Yes, it is a hybrid that looks like a tablet but has the characteristics of an ultrabook. Yes, you got it right – all in one package. When the device is closed you have an 11.6’’ tablet that runs under the new platform which is actually also officially introduced today – the new Windows 8. The screen is attached to a steady and well-balanced “SurfSlider” mechanism which allows you to easily pull the screen up and uncover the keyboard lying just below. The words Sony uses to describe the device are “a handy tablet”. The general idea is that thanks to the opening mechanism when you pull open it, the tablet converts into a laptop computer as we find the keyboard just below the tablet. But it seemed to us more like having a tablet attached to a keyboard rather than a laptop. Its thickness is only 17.85 mm when in tablet state. The height is 199mm and the width is 320mm. The display is one of the many advantages of this machine, the graphics are excellent and the wide viewing angle also gives you flexibility and makes it easy to use outdoors. This IPS Full HD display with 1920×1080 pixel resolution is very sensitive and perfectly responsive to the touch of your fingers. You will find a home Windows 8 button on the front bottom periphery line of the tablet. It is actually kind of awkward to use the tablet while in your hands because of the wide screen size and the weight of 1.3 kg which is above the average for a tablet. The keyboard was a pleasant surprise for us, it is island-style and there is plenty of room between the keys so it is much more comfortable to use than the sensor one on the tablet. What is also pretty cool is that the keyboard is backlit. However, we wish that Sony had featured a touchpad, but instead, you will find an optical button in the middle of the keyboard that acts like one. It felt a bit awkward and took us some time to get used to using it. What we found pretty useful and cool is the fact that Sony has featured a stylus which makes it so much easier no matter if you need it for accurate control over the display or you just like to draw or handwrite something, it’s always handy. The performance of this Sony hybrid is provided by a 1.7GHz Inter Core i5 processor. The operating RAM is 4 but can be upgraded up to 6 GB. The HD graphics on this screen are provided by an integrated Intel HD 4000. The hard drive storage capacity of this compact tablet-ultrabook computer is 128GB SSD. If you didn’t believe me at first that it’s an ultrabook, now you probably don’t have any doubts about it. The video call experience is a pleasure with the 2.4MP Webcamera with Sony Exmor sensor which is centrally positioned just above the display. The body of Sony VAIO Duo 11 looks and feels compact, slim but still solid and stable. You will find multiple switches and controls along its edges and design lines. Under the front edge we found a volume controller, a VAIO care button and an orientation lock. The backside also features two stereo speakers and a second webcam of 2.4MP. When we talk about connectivity the hybrid features everything the common ultrabook offers: a USB and HDMI ports on the right, VGA out and a card reader on the left and a headphone jack. You also have two USB ports version 3.0. And of course the more and more popular NFC – near-field communication technology. We were pleased by the overall performance of the machine but it doesn’t go without critics. We weren’t impressed with the battery life. The 4.960 mAh battery falls below the average having in mind that it’s a wide screen with ultrabook characteristics. The video playback killed the battery in around 5 hours.